In the midst of 2016 we took the plunge, sold our houses in the Netherlands and left for Portugal. After a serious renovation of our Portuguese country house we are ready to welcome you in one of our four double guest-rooms. My name is Jacqueline Bonebakker, before diving into our Portuguese adventure I was a pedicurist in Utrecht and had my own practice at home. I loved this job very much and would like to continue this kind of work in the future. Therefore I am very happy it’s possible to combine this with running a B&B. Just imagine how nice it would be to receive a foot reflexology therapy massage while staying at Bed & Breakfast Porturama. People often only discover on holiday how tired they really are, physically or mentally. A foot reflexology therapy massage can help you to de-stress because of the relaxing nature of the treatment. You won’t think so but a good foot reflexology therapy massage can have the same effect as a full body massage. A foot reflexology therapy massage can be booked in 2017. I plan to offer full pedicure treatment from mid 2018 onwards. Waxing of legs will be one of the possibilities, I will be more than happy to take your appointment. My name is Eric Husken. Before starting our Portuguese adventure I worked in IT. I have always liked this kind of work and could combine this with my great passion for travelling. 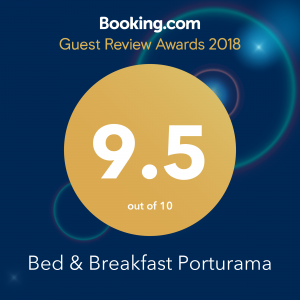 Other countries always appealed to me and when the possibility arose to start Bed & Breakfast Porturama with Jacqueline I grabbed this opportunity with both hands. Next to running the B&B I will spend my time in our vegetable and fruit garden, I used to have 200m2 garden in the Netherlands, now I face the task of developing nearly 10.000m2! I hope you will enjoy the freshly grown strawberries, peaches and other delicacies from our garden.